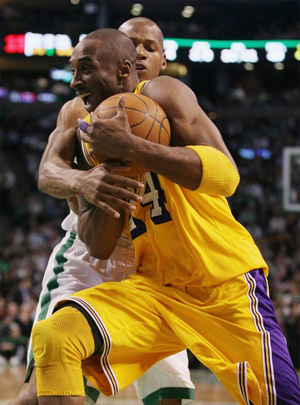 Kobe Bryant drives to hoop against Celtics. Ray Allen may have gotten the biggest cheers for his record-setting night, but Kobe Bryant got the last laugh, as the Lakers rallied from 15 points down to beat the Boston Celtics 92-86 at the TD Garden on Thursday night. Bryant scored 20 of his game-high 23 points in the second half, including eight in the fourth quarter, as the Lakers avenged a very poor 109-96 loss they suffered against the Celtics two weeks ago at Staples Center. The game got off to a rocky start for the the champs, as they shot poorly early, and Ray Allen torched them for 12 points in the first quarter, including his 2,561st three-pointer that put him past Reggie Miller as the league’s all-time leader in field goals beyond the arc. But Allen struggled after the first quarter, as the Lakers worked hard to run him off the three-point line, and he finished the game with 20 points but just 3-8 from deep. The Lakers trailed 37-22 early in the second quarter, before the bench helped to chip away at the lead led by Lamar Odom and Shannon Brown. A 10-0 spurt late in the quarter pulled the Lakers to within eight at 53-45 at halftime. In the second half, the Lakers again had a 10-0 run to start the half, and took their first lead of the game at 61-60. The teams went back and forth for most of the third quarter, with the Lakers holding a slim 72-68 going into the fourth quarter. With Bryant on the bench to start the fourth, Lamar Odom hit a three-pointer, Brown followed up a miss with a wild putback to give the Lakers a 77-68 lead. The Celtics put their starters back in, and got the game to within 82-79, but Bryant hit several crucial baskets down the stretch, including a 12-footer with 54 seconds left that sealed the win. The win was easily the Lakers’ biggest of the season, as they have struggled both home and away with the league’s elite teams. The Celtics did play without Shaquille O’Neal again, and lost Nate Robinson early in the game, but did have their four All-Stars. Pau Gasol rebounded from a poor performance against Boston in the last meeting, to score 20 points and grab 10 rebounds. Andrew Bynum was a force down low on both sides of the ball, scoring 16 points to go along with nine rebounds. 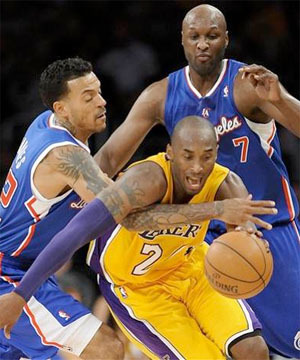 Shannon Brown had 12 off the bench, and Lamar Odom chipped in with 10 points and a game-high 12 boards. The Lakers managed to shoot a solid 47.9.% (35-73) from the floor, and outrebounded the Celtics 47-36. Boston, who is the only NBA team that shoots over 50% from the floor, were held to 40.2% (33-82) from the field and just 5-16 (31.3%) from the three-point line. Los Angeles also had 20 assists in the game, doubling the paltry 10 they had in the first meeting. Besides Allen’s 20 points, Paul Pierce had 15 points on just 6-15 from the floor, Rajon Rondo had 12 points and 10 assists, and Kevin Garnett added 10 points and 11 rebounds, but hit just 4-13 from the floor. The Lakers are now 3-0 on their current seven-game road trip, but are in the midst of playing four games in five nights. They play tomorrow night in New York against the Knicks, for the team’s second and final meeting this season. 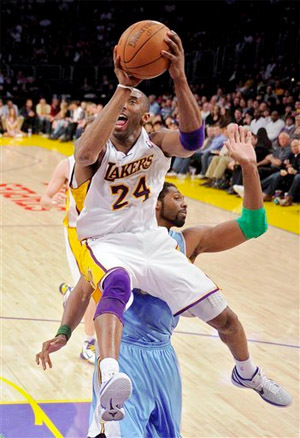 The Lakers won the first match up easily 109-87 at Staples Center back on January 9th. Bryant led the way that night with 27 points, 10 rebounds, and five assists.